The 10 GPM @ 2,000 PSI hydraulic motor provides optimum speed (250 RPM) for quick drilling of holes. At 53 lbs., it is one of the lightest hydraulic rail drills on the market. Flat-faced couplers are hard plumbed at the top of the unit for easy connections. Durable metal carry case, tool kit, and coolant bottle are included with every drill. 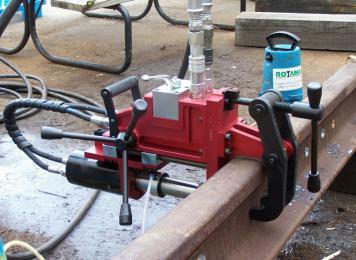 Index bars and rail shoes available for most railroad and crane rail profiles. Convenient storage compartment on the side of drill for rail cutters.